On 27/11/2006 Rainer Kling and Erwin Schwab discovered the minor planet 2006 WV129. 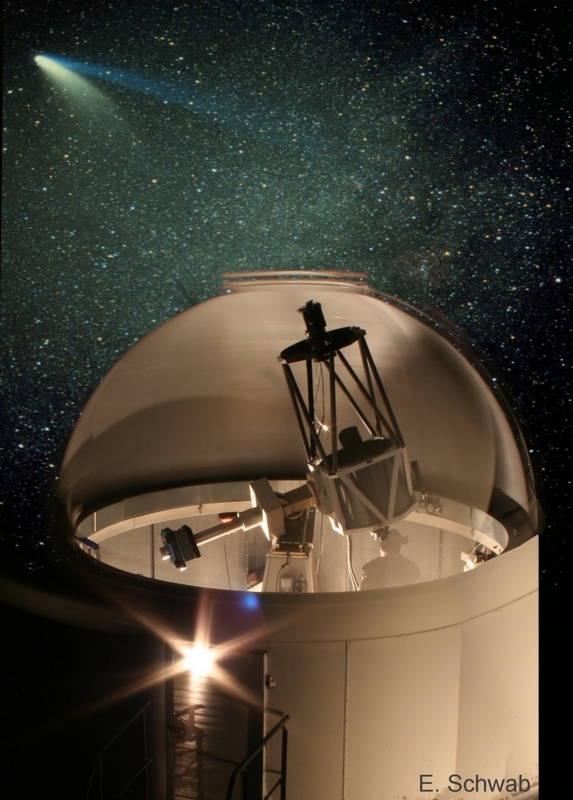 It was the first minor planet dicovered at an observatory of the Association "Physikalischen Verein". With this discovery, an ancient tradition of the association was continued. Because at the beginning of the 20th century the "Physikalischen Verein" operated the Planeten Institut, which was one of the world's first Minor Planet Centers. The works at that time were essentially theoretical. 2006 WV129, which now has the name Neeffisis, was the first minor planet discovered in the more than 180-years history of the association. The name Neeffisis is a combination of Christian Ernst Neeff and the goddess Isis. Christian Ernst Neeff was co-founder of the association "Physikalischen Verein" in 1824 and its president. The emblem of the association is the goddess Isis. On 25 February 2009 we were able to discover one of the rare dangerous near-Earth asteroids. 2009 DM45 has a diameter of about 150 meters and approached the earth at a distance of only 5.7 times the Moon distance. It was the 5th discovery of a dangerous asteroid from a German observatory. The first minor planet, for which we submitted a naming proposal follows the name (204852) Frankfurt. It was published on 2009 April 9. in the Minor Planet Circular # 65714. Entdeckungsgeschichte und Entdeckungs - Fotos des (204852) Frankfurt. The spanish Observatorio de la Sagra honored the two initiators of the Taunus Observatory astrometry project. The minor planets (185638) Erwin Schwab and (185639) Rainer Kling were named after them. On 2009 June 7. the new minor planet names were published in the Minor Planet Circular # 66244. On 2009 July 8. Stefan Karge, Rainer Kling, Erwin Schwab and Ute Zimmer received the Soemmerring-award of the association "Physikalischer Verein" for their work in "astrometry of solar system objects and the discoveries of asteroids". 102 discoveries were finaly credited until March 2017 to the astronomers of the Taunus Observatory. With this discovery rate the Taunus Observatory is on 5th place of the German observatories (including the professional observatories).